The bad news is that Madison Avenue values people at a rate that is considerably below minimum wage. The good news is that most people are okay with that. 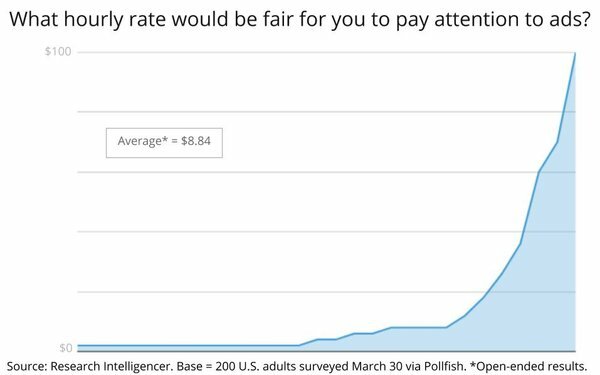 To find out what consumers think the fair value exchange is for paying attention to advertising, Research Intelligencer surveyed two samples of American adults about what they feel is a reasonable hourly rate. The first sample was given multiple choices ranging from $1 to “more than minimum wage” (currently $7.25). The second sample was asked to provide their own open-ended responses. 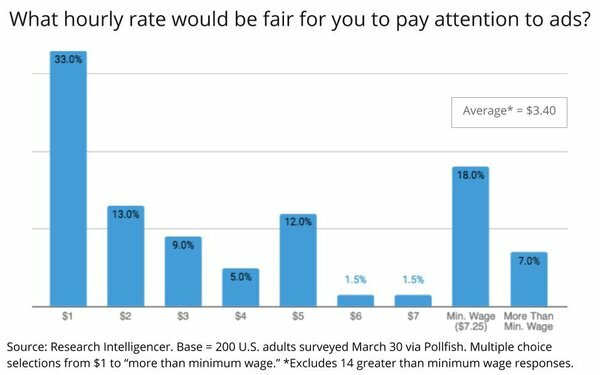 Interestingly, both surveys yielded similar ranges, and the majority of respondents deemed something less than minimum wage to be a fair value exchange. The average of the multiple-choice respondents was $3.40, which is close to the actual amount that U.S. advertisers currently spend, in aggregate, to reach the average American per hour of pure advertising time (see related story in today’s edition). On an open-ended basis, the average was $8.40 -- just over minimum wage. But that average was skewed by some very high-end results -- as much as $100 per hour of advertising attention. (Interestingly, none of the respondents entered an amount higher than $100). 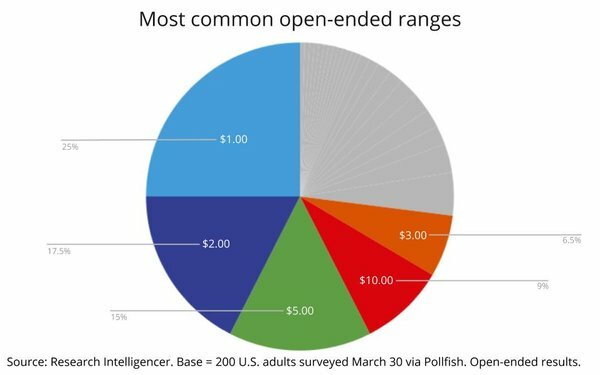 The spread among open-ended respondents was from $0 to $100, although the concentration was in the $1 (25% of respondents), $2 (17.5%), $3 (6.5%), $5 (15%) and $10 (9%) ranges. The best news of all is that while the hourly rate valuation is mostly theoretical (it’s rare for advertisers to pay consumers directly to pay attention to advertising), respondents to both surveys felt overwhelmingly that “advertising is a fair price to pay” for the ad-supported media it underwrites for them. More than three-quarters (77.3%) of respondents said advertising was a fair value exchange, while only only 10.8% said it was not. Twelve percent said they weren’t sure or did not know. 4 comments about "What Americans Think Is A Fair 'Hourly Rate' For Advertising". Douglas Ferguson from College of Charleston, April 2, 2018 at 11:01 a.m. Watching ads is not work, any more than swatting mosquitos is work. Joe Mandese from MediaPost, April 2, 2018 at 11:07 a.m.
@Douglas Ferguson: You've obviously never participated in a focus group... No one said it was "work." The analysis simply asks what people assess what the fair value of the exchange is. The value being exchanged isn't labor, it's people's time, attention, consideration, data, etc. Ed Papazian from Media Dynamics Inc, April 2, 2018 at 11:51 a.m. Even if we discount 50% of Nielsen's commercial minute "audience" as not being in the room and/or paying no attention, the typical national TV advertiser pays something like three cents to get a consumer to watch a 30-second TV commercial. Just thought I'd toss that in to create a frame of referrrence for those reading this article. 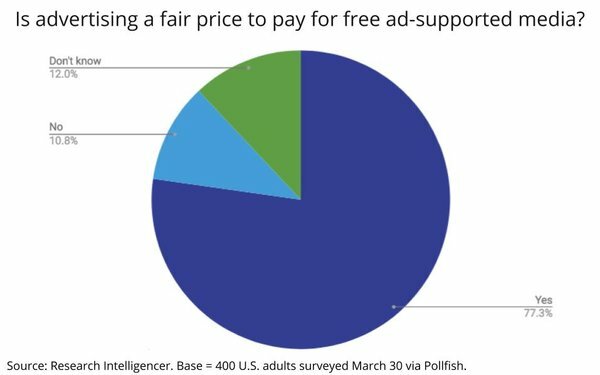 As for the percentage of respondents who think advertising is a fair price to pay for consuming ad-supported media, the 77% positive response is about the same as has been noted in many other studies--mostly about TV---over the years. M S from DTS, April 3, 2018 at 1:41 p.m. But what is a fair hourly rate for watching ads when the content is NOT free? Such as ads on a paid OTT service like Hulu, ads on cinema screens, etc.